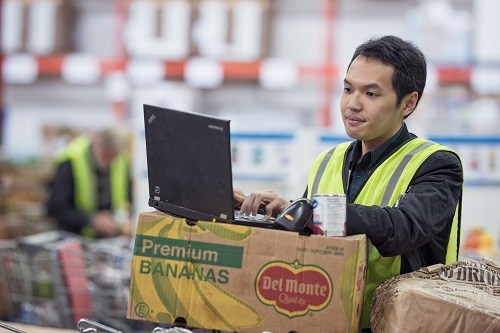 In an era of using data to gather business intelligence, an alumnus from Land and Food Systems is making a difference at the Greater Vancouver Food Bank. Kevin Elsaputra (MFRE 2016) is the organization’s first-ever data analyst. Elsaputra made a major impact on operations: he is building strong data protocols, practices and reports to make evidence-based decisions that help improve food quality. Elsaputra became a full-time employee in February 2018 and he supports many areas of the organization, such as predicting fluctuations in GVFB member visits across their distribution sites each week. Elsaputra began working with the GVFB while he was a student in UBC’s Master of Food and Resource Economics program back in 2016. His initial project was under the supervision of Professor James Vercammen. Initially, they were refining an existing database at the GVFB that catalogued food donation information – name, UPC code, ingredients, nutrition, etc. That project grew in leaps and bounds with support from Land and Food Systems’ Learning Centre. The Learning Centre provided two UBC IT staff who augmented the database with a nutritional ranking program based on fields already captured. This custom-built program is still in use today and is tracking over 9,500 different food products with a user-friendly interface. Elsaputra has worked closely with nutritionists to set food quality standards. The GVFB is a progressive organization and has elevated monitoring the nutritional value of incoming and outgoing food to new heights. In 2016, the GVFB began developing nutritional rankings using BC’s Guidelines for Food and Beverage Sales in Schools and the Canada Food Guide then modifying them for a food bank-specific setting. Throughout this work, GVFB members have shared that they have noticed an improvement in food quality and appreciate that they can access more nourishing foods.